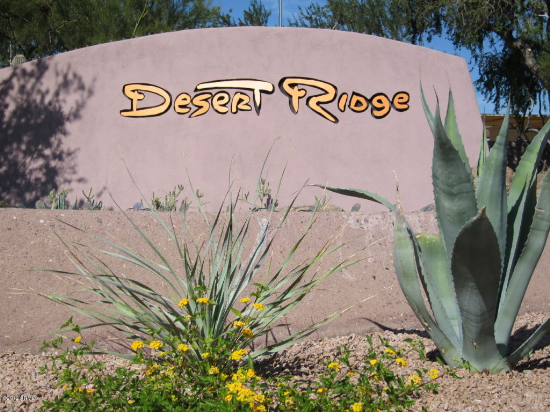 Located in the beautiful Northeast Valley, Desert Ridge is one of Arizona’s largest master planned communities. Desert Ridge encompasses the area south of Pinnacle Peak Road and between Scottsdale Road and Cave Creek Road. There are many properties and houses for sale in Desert Ridge. We offer a great place to start searching to find homes for sale in desert ridge and other outlining communities. You can also save your searches and Desert Ridge properties and come back anytime. Click the Create Account button above and access your Property Organizer. The anchor of Desert Ridge is the Desert Ridge Marketplace. There are many amenities such as shopping, dining and entertainment. Next door to Desert Ridge Marketplace is City North where dining and nightlife options abound. Directly across the street from Desert Ridge Market place is the luxurious J.W. Marriott Desert Ridge Resort and Spa and adjacent Wild Fire Golf Club. Desert Ridge is located within the Paradise Valley Unified School District. Local schools are Wildfire Elementary School, Desert Trails Elementary School, Fireside Elementary School, Explorer Middle School and Pinnacle High School. There are also several private and charter schools located in the area. Are you ready to buy one of many Homes for Sale in Desert Ridge? The best properties in Desert Ridge sell fast! Don’t let your dream home in Desert Ridge slip away. Be one of the first to see homes hit the market. Sign up for email property alerts now! Thinking of selling your Desert Ridge real estate? Do you want to know the homes being sold in your Desert Ridge neighborhood and the price they are listed for? Sign up and receive property alerts directly to your inbox! Choose a community to fit your active lifestyle! Containing luxury homes in Aviano by Toll Brothers, Fireside at Desert Ridge by Pulte Homes/Del Webb, Cielo at Desert Ridge by D.R. Horton, Wildfire at Desert Ridge, Stonecrest, Sierra Pass, Wildcat Ridge, the brand new Estates at Ridgeview by Ashton Woods Homes, and others, this community has it all. You've come to the right place to search homes for sale in Desert Ridge. There are currently two communities with new homes being built; Fireside at Desert Ridge by Pulte Homes/Del Webb and the Estates at Ridgeview by Ashton Woods Homes. Fireside contains both single family detached homes and attached townhomes/condos. Homes range in size from 1,400-4,000 square feet. Fireside at Desert Ridge includes a community center with a workout center, heated lap pool, resort style pool, child care and planned activities. There are two community parks with playgrounds, sports fields, and tennis and basketball courts. Enjoy the many jogging paths that run throughout the Fireside community. The Estates at Ridgeview is a brand new community currently being built. According to their information, sales will begin in August 2013. This will be a gated community with large home sites and floor plans ranging from 2,700 to 4,400 square feet. There are several choices in the area for low maintenance, “lock and leave” living. With gated entries, heated pools and spas, walking trails, fitness centers, security systems, private garages, fire protection and sprinkler systems, you will be secure in your investment. Bella Monte at Desert Ridge borders the Wildfire Golf Course and offers five different floor plan options. Toscana backs to the Wildfire Golf Course and is directly across the street from City North. This property offers one, two, or three bedroom units, elevators and 24 hour guarded gate access. The Villages at Aviano have access to the beautiful Aviano Community Center and offer many different floor plans. And La Verne’ is just around the corner from Fireside at Desert Ridge. Apartment living in Desert Ridge is like staying at a resort with multiple pools, spas, sun decks, playgrounds, fitness centers, clubhouses and business centers. Shade at Desert Ridge is directly across the street from Desert Ridge Marketplace with all of its shopping, dining, and entertainment within walking distance. Many complexes have gated access for your safety and privacy. Enjoy the outdoors with jogging trails, barbeque areas, and beautiful landscaping. Pinnacle at Union Hills has many amenities such as fireplaces, crown molding and oversized tubs, that will make you feel at home. Sonterra is a pet friendly community with six large floor plans available.